MEMPHIS, TN (WMC) - Cold temperatures will continue as we push into the weekend. Mix that along with moisture building into the area and we are tracking the potential for wintry mix for portions of the Mid-South. Deep moisture will be pulled into the region thanks to an area of low pressure to our south this weekend. This will give us rain chances as we move into Saturday and Sunday. Right now, Friday night into Saturday morning are the best timing for this potential wintry mix. Mainly for locations north of Interstate 40 with little accumulation expected. 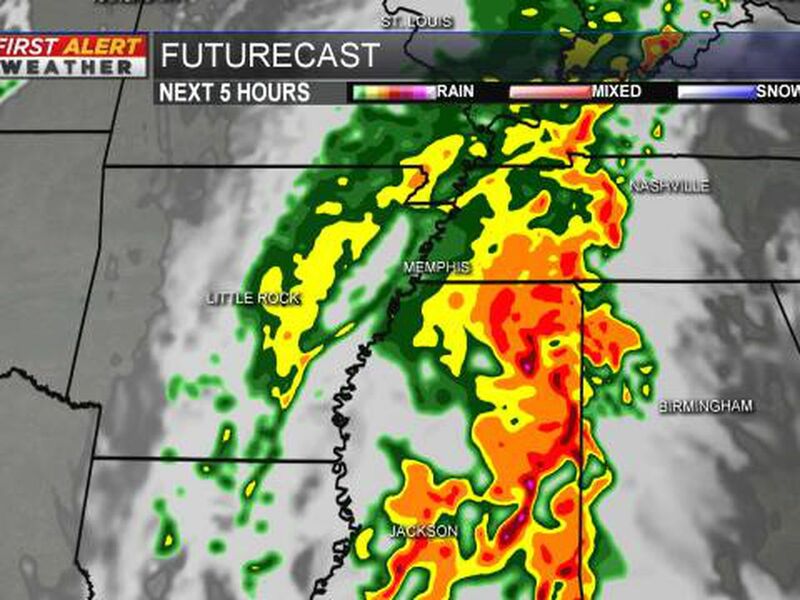 As the moisture over spreads the Mid-South for Saturday morning, most of the are will be dealing with just a cold rain. The areas north of Interstate 40 have the best chance to see the rain change over into a wintry mix. As you can see with the futurecast above, temperatures will be the key in determining if the rain switches over to any frozen precipitation. With temperatures close to freezing, one degree above or below the freezing point can make the difference between a cold rain and wintry precipitation. Not only are we looking at wintry precipitation for Saturday morning we are also looking at Sunday morning as the moisture looks to linger into the region. The same story goes for Sunday morning, a lot of the region will see just a cold rain, but if temperatures drop enough, we could see that rain mix with some wintry precipitating. Now as with any wintry weather situation in the Mid-South this will continue be fluid. Forecast models have been back and forth when it comes to the cold air and rain matching to cause the wintry precipitation. Make sure to keep it with the WMC Action News 5 and the First Alert Weather Team for the latest with the cold temperatures, rain and wintry mix for the weekend.